A personalised Christmas card that can be personalised with a name. 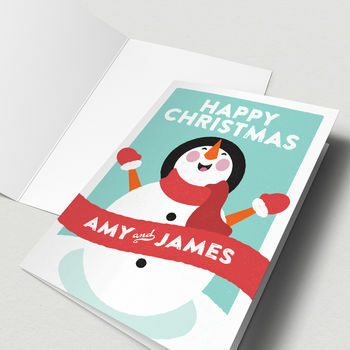 A festive card to send to friends and family, this Christmas card features a laughing snowman illustration and a coloured banner which can be personalised with names or a message of your choice. It is supplied with a premium envelope and is sealed inside a clear cellophane bag to keep it in tip top condition until you are ready to use it. We post our cards in a rigid envelope mailer to ensure safe delivery. As an additional option, you can choose to send this card direct to the recipient. This is perfect if you are in a hurry or want to save the hassle of posting yourself. If you opt to send direct, your message will be neatly handwritten exactly as typed in the box and sent directly to the delivery address provided. Receipts will not be sent to the recipient.